How Does the Mares Abyss 22 Navy Compare? What makes a reliable scuba regulator? Well, according to the U.S. Navy, the Mares Scuba Abyss 22 Navy perfectly fits that description. But, what does that mean for you? 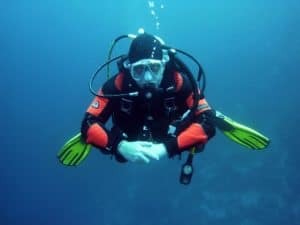 Oftentimes, looking at the technical details of scuba gear can make you wonder if it’s all just hype that sounds good in theory, or if all those fancy features are overkill. You shouldn’t have to take a gamble when investing in high-end scuba gear. The Abyss line of regulators gets much of its popularity from its reliable performance, and the big testament to this is the record for deepest solo dive. It reached an impressive -313 meters. Another test saw 101 divers sharing a single first stage, breathing at the same time through it for 40 minutes. Let’s look at what makes this possible. The lightweight Mares Scuba Abyss 22 Navy first stage has gone through some clever changes. First of all, Mares removed all metal that wasn’t crucial to its structural integrity. This also improved its overall performances. The biggest benefit is that the increased surface area leads to improved thermal characteristics. 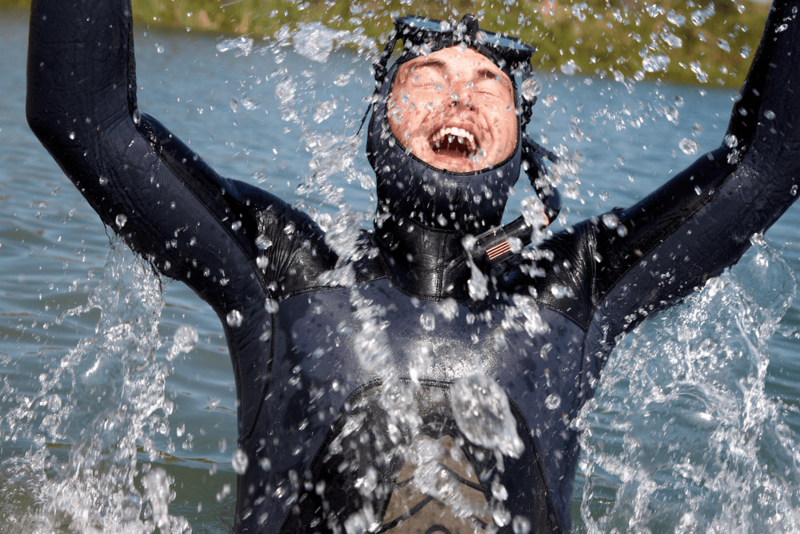 This makes the Mares Scuba Abyss 22 Navy even more dependable when you dive in really cold water. And Mares regulators were already known for their great reliability before this upgrade. Another added benefit is the lower overall weight, as well as a more distinct signature look. Chrome-plated marine brass makes up the entirety of the structure. The first stage of the Mares Scuba Abyss 22 Navy also implements the unique and patented Mares DFC system. These letters stand for “Dynamic Flow Control”, and the mechanism minimizes dips in intermediate pressure when you inhale. This is incredibly helpful in those most demanding diving conditions, where the DFC system really puts in the work. That’s the main feature that made the 101 divers able to breathe together through this first stage. If we’re being realistic here, it’s very unlikely that you’ll ever encounter a scenario where you have to push your regulator to these limits. But it’s good to know just how capable the Mares Scuba Abyss 22 Navy is, and to know that you’re safe when you dive. Its patented Tri-Material Valve further enhances the safety and reliability. This design makes it so that the valve’s head will always seal it perfectly, regardless of conditions. It prevents uncontrollable freeing even in the toughest of circumstances. The combination of brass, soft polyurethane, and heavy duty polyurethane provides excellent durability. When it comes to the hose connections, there are four low-pressure ports and two fixed angle high-pressure ports. A new Mares Scuba Abyss 22 Navy is Nitrox compatible all the way to 40% oxygen without any modification. 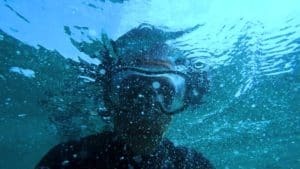 This makes it great for more extreme diving. An all-metal construction gives the second stage excellent thermal properties. You won’t see any ice forming on it and producing those pesky free flows when you’re diving in colder water. It implements a simple downstream demand valve system. Thanks to that nifty DFC and the way it reduces dips in intermediate pressure when you inhale to a minimum, Mares can use a trusty, simplistic valve system without any drop in performance. You won’t find any user controls on this second stage. The mesh grid and VAD system are responsible for this. VAD is short for “Vortex Assisted Design”. This system leads air through a bypass tube straight to the mouthpiece. The result is a vortex that emerges inside the second stage and holds down the diaphragm as you inhale. This reduces breathing resistance at every diving depth. The mesh grid that’s integrated in the front cover reduces the effect of water flow on the diaphragm. This way, the Mares Scuba Abyss 22 Navy can prevent free flows even in strong currents. A Super Flex hose completes the second stage. Mares Scuba designed this hose to be extra durable and flexible to provide that extra bit of safety and dependability, while also improving mobility in order to reduce jaw fatigue. You’ll find the Navy II in the higher end of the range, while the first edition has a lower average price. We recommend getting one from Amazon. The regulators come with a two-year warranty. We’ve analyzed a number of reviews from ordinary users and professionals on sites such as Amazon to find out how the Mares Scuba Abyss 22 Navy performs next to its closest competitors. The Abyss 22 has an average rating of five stars on Amazon, so we’ll be comparing it to three similar regulators with similar user ratings. The Scubapro Evo MK25/A700 is one of the most luxurious regulator sets you can find on the current market. Combining their MK25 first stage and A700 second stage makes a formidable regulator set. A good place to start the evaluation of this regulator is its freezing-resistant design. Like all ScubaPro regulators, the Evo is CE approved for 43000 psi cold water diving. High-end models like this one have even gone through testing in extremely harsh diving conditions with temperatures below 36°F. This ensures that you won’t ever experience it freezing, which would endanger both the regulator and your own life. This is a popular and well-renowned first stage that’s proven itself through lots of use. The air-balanced flow-through piston-controlled design provides reliable and easy breathing regardless of diving depth, water temperature, and tank pressure. There are two high-pressure ports and five low-pressure ports. That one extra port can make a significant difference when it comes to setting up your personal perfect diving rig. It’s extra easy thanks to the swiveling design. The low-pressure ports are fitted on a turret so you can find an effective and comfortable routing setup with any equipment. The hoses may be restrained, however, if you’re wearing a big BCD with a high tank band placement. But it shouldn’t be a problem if you flip the first stage upside down. The finned cap of the MK25 is a clever piece of patented technology that helps with cold water diving. It’s an anti-freezing mechanism where the fins work like a radiator, increasing the regulator’s surface area. This enhances heat transfer between the water and the internal parts. When dropping gas pressure causes unwanted cool-down, the heat transfers and prevents freezing. This is one of ScubaPro’s very best second stages. The chrome-plated marine brass body makes it sturdy and very good at handling different temperatures. It also helps retain a smaller size, although it does weigh a fair bit more than the Mares Abyss 22 Navy. The breathing resistance level is excellent, and so is the flow rate. You’ll always find it easy to breathe thanks to the way it assists your breathing. The VIVA (Venturi Initiated Vacuum Assist) system helps keep the valve open as you breathe with ease. As high-speed air flows past the vane it creates a low-pressure environment in the second stage housing. The resulting suction draws the diaphragm into the housing, thus keeping the valve lever under steady pressure so the valve stays open. There’s one control knob for the VIVA system and vane and a big purge button. The placement and size make them very easy to use. Precision-molded technopolymer and carbon fiber components make the second stage extra resistant to freezing and corrosion. They also help reduce the weight somewhat. This regulator set performs at an impressive level, regardless of diving conditions. The flow-through piston grants consistent and reliable airflow without effort regardless of changing tank pressure. Breathing is smooth thanks to the air-balanced valve that reduces inhalation resistance to an impressive degree. At the same time, the very high-flow exhaust valve makes it easier for air to exit, so it takes less effort to exhale as well. It also reduces the amount of bubbles in front of your eyes. No matter what your depth and orientation are, and no matter what temperatures you’re dealing with, you will have an easy time breathing. The adjustable VIVA system lets you fine-tune the inhalation resistance and breathing control to your liking. This, along with the small dimensions and flexible connection port layout, help ensure good comfort when you dive. Thanks to the many anti-freezing and temperature equalizing mechanisms, it’ll withstand extreme cold water diving. Each ScubaPro product comes with a one-year warranty. This covers repairs and replacements. Learn more here. The Mares Abyss 22 Navy has a warranty that’s at least twice as long and better in general. 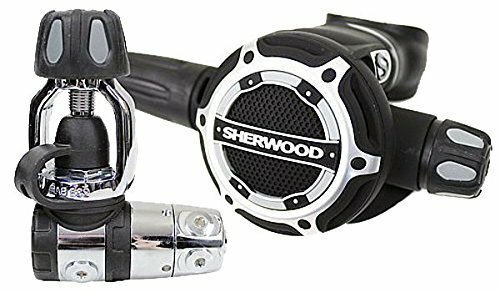 The Sherwood SR2 Regulator is the upgraded edition of the highly praised SR1. Let’s see how well it compares to the Mares Abyss 22 Navy II. The first stage has a similar design to the ones mentioned before. It uses a two-piece piston system that provides precise balance and intermediate pressure control. This mechanism is a sealed environment, so there won’t be any buildup of salt, sand, or muck. It will withstand ice as well. When it comes to connection ports, there are seven in total. You find four medium-pressure ports on the rotating turret, and one more at the head to enable side-mounting. Then there are two high-pressure ports on the main body. This stage is built from specialized polymers and plastics with a retaining ring made of marine-grade stainless steel to lock the purge mechanism into place. The valve is very compact and light, and it’s pneumatically balanced to ensure consistent performance. The rate of gas delivery is constant at all tank pressure levels. Six entry holes help even out the pressure on the outside of the diaphragm. This prevents over-delivery and free flow as you begin diving or enter a strong current. When it comes to controls, there’s one knob for breathing resistance adjustment and one smart demand lever. The latter works with a floating crown which responds to depressurization, reducing the pressure on the seat. Thanks to this mechanism, you can store it dry for a long time without permanent effects on the valve seat. This means a longer lifespan and less service needed. The valve design BRA control makes it very easy to find a perfect setting for smooth breathing. It won’t free flow as you dive, even if you’re a bit careless. The purge is easy to use and designed to be gentle and comfortable. Bubbles move away from the face. Since it’s a compact and light first stage, you won’t have to strain your jaw to use it. The heavy second stage can be a little inconvenient. 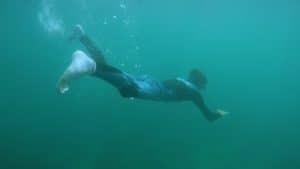 It’s not as good for cold water diving as the Mares Abyss 22 Navy though. The Sherwood SR2 comes with a limited lifetime warranty, but not every part is covered and there may be extra fees for replacements. 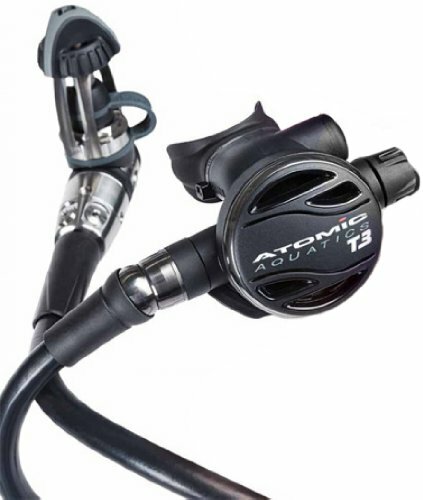 The Atomic Aquatics T3 is Atomic’s newest flagship, and probably the most powerful regulator on the market. The structure is made from precisely manufactured high-grade titanium. At 1.7 lbs, it’s the lightest full-size regulator on the market. It’s reliable and durable and won’t need regular service. Like the others in this article, it’s Nitrox compatible up to 40 percent without modification. In addition to being light, titanium provides amazing corrosion-resistance, temperature handling, and overall performance. Upgrades from the previous model were focused on reducing size and weight. All non-essential material is stripped. Even the DIN thumb wheel and yoke are smaller. The patented Jet Seat balanced high-flow piston provides super smooth and responsive performance to produce a very natural breathing feel. It’s environmentally sealed as well, so no silt or muck can get in. This and the O2 compatible grease also help prevent freezing. Two high-pressure ports and a swivel cap with five low-pressure ports allow for flexible routing. A balanced valve system keeps breathing resistance to a minimum. The full titanium comfort swivel helps reduce tug, and it moves with incredible ease. A PVD finish improves resistance to scratches that could hamper swivel function. The Seat Saving Orifice really helps extend the time this second stage can go without needing service. Instead of keeping the seat under tension, the T3 valve moves the orifice further from the seat when it’s depressurized. So the T3 can go for very long without service, and still provide consistent performance. A rapid adjustment knob helps de-tune the regulator. Turned down, it reduces surface free flows and turned up, you get maximum airflow and performance. There’s no Venturi switch because it’s rendered redundant by the Automatic Flow Control mechanism. This feature regulates air flow in the second stage and directs air straight to the mouthpiece or diaphragm to shut the valve fast. The sum of these clever components is a very comfortable high-performance scuba regulator with a very smooth breathing feel. Its light weight makes it both comfortable and ideal for traveling divers. The dual silicone mouthpiece adds to the comfort and won’t wear on your gums. Easy controls provide a greater sense of safety and ease. You can use the whole front to purge, which removes the issue of purging with thick gloves. Thanks to the AFC, you won’t need to think much about pressure when descending or ascending. There’s a limited lifetime warranty for Atomic Aquatics T3s, including a full warranty for the first two years. Read more here. 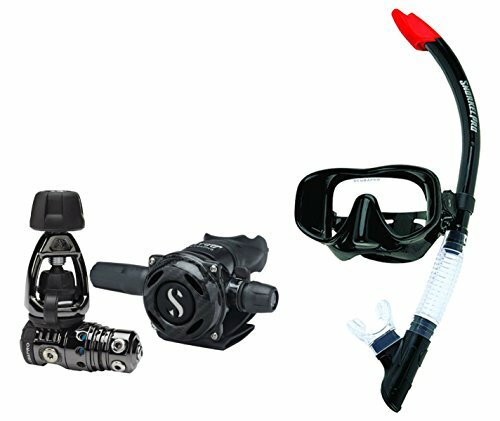 If money is no concern and you want a truly superb scuba regulator set, this is the one for you. Now that we’ve examined the details and competitive strength of the Mares Scuba Abyss 22 Navy, let’s sum up the pros and cons. The Mares Scuba Abyss 22 Navy brings some great improvements to an already great regulator with a history of popularity and high performance. Its two lightweight stages work together to provide a natural breathing cycle in all diving conditions. It stands up well to the biggest competitors really well, and it’s earned a solid five-star rating.